I am glad to reach a place that does not reach with other tools because there is enough length. This review is about item#02196372. Although I bought various ball drivers so far, the tip quickly got stuck and lost and it became useless, but this product is a different thing. There is no feeling uneasy when using it. Very easy to use and full of sense of security. Manufacturers who do not understand cheap goods or something are necessarily broken and will lose. There are various manufacturers, but this was no mistake. This review is about item#07319767. This review is about item#02196406. It is easy to carry because there is no big size wrench that you do not normally use. When power is added, it is considerably tight, but it can be used with confidence. I think that there is no problem in terms of strength and practical use. If you want a greedy color coating for each size is perfect. Adjustment of manufacturing equipment etc. I think that there is the most stable feeling among the wrenches I used to date. You can turn on licked screws, old equipment, overseas facilities with confidence. After purchasing BLX 9 M, I purchased BLX 7 M. 9M is always in the tool box, 7M is a commonly used size, so I use it as a taking out tool. 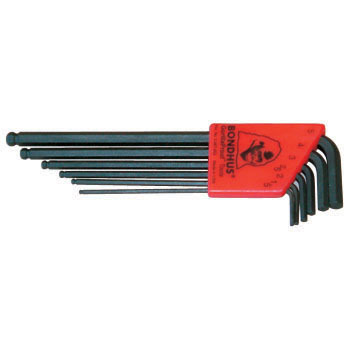 I trust BONDHUS as a hex wrench. There are also more expensive wrenches, but I have never felt dissatisfied using this.